CarGurus has 57,493 nationwide Sierra 1500 listings starting at $1,950. 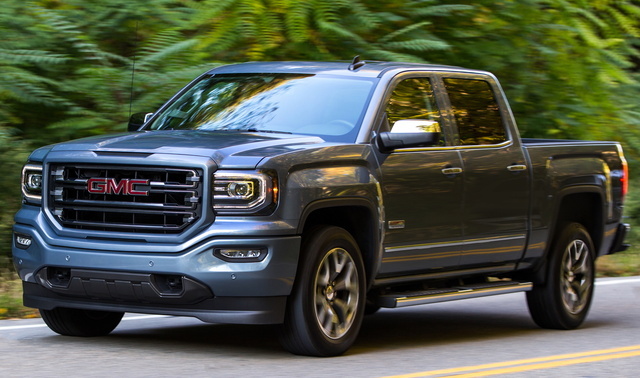 The full-size pickup is a fixture on American highways these days, and GMC’s half-ton Sierra 1500 is arguably among the best-looking and best-equipped of the bunch. For 2017, this capable Jimmy, a close relative of Chevy’s Silverado 1500, gets a few upgrades and changes to its already impressive list of features, including new 18-inch off-road tires, capless fuel fill, and Android Auto smartphone apps added to GM’s IntelliLink infotainment setup. There are also two new exterior color selections due for the upcoming model year, a noteworthy upgrade to the available Enhanced Driver Alert safety package, and some minor changes to various other options packages. Again for 2017, the Sierra 1500 will offer three cab configurations: the 2-door, 3-passenger Regular Cab, the 4-door, 5/6-passenger Double Cab, and the roomier 4-door, 5/6-passenger Crew Cab. Three bed lengths are also available: the 8-foot long bed (Regular Cab only), the 6.6-foot standard bed (all cabs), and the 5.8-foot short bed (Crew Cab only). The Sierra 1500 comes in four trim levels: the Base, SLE, SLT, and Denali. The first 2 are available in all cab configurations, the SLT only in Double and Crew Cab versions, and the Denali only as a Crew Cab. Of course, the 2017 Sierra 1500 lineup is again delivered with standard rear-wheel drive (RWD), while all trim levels return eligible for optional part-time 4-wheel drive (4WD) that boasts low-range gearing, auto-locking hubs, and, in higher trim levels, an electronic locking rear differential. The standard engine in the Base and SLE is a 4.6-liter V6 putting out 285 hp and 305 lb-ft of torque, mated with a 6-speed automatic transmission with a tow/haul mode. Look for mileage numbers to reflect the current 18 mpg city/24 highway/20 combined for RWD trims and 17/22/19 for 4WD versions. Max towing capacity returns at 7,600 pounds when properly equipped. The Sierra 1500 SLT and Denali trim levels are delivered with a 355-hp 5.3-liter V8 engine that’s optional on the lower trims. This mill is paired with either the standard 6-speed automatic or an available 8-speed automatic (also boasting a tow/haul mode) which, as the numbers show, doesn’t help much with fuel efficiency. EPA-estimated mileage for current RWD trims toting the 6-speed is 16/23/19, or 16/22/18 with 4WD. With the 8-speed automatic, fuel efficiency checks in at 16/22/18 with RWD and 15/21/17 with 4WD. One advantage the 8-speed automatic does offer over the 6-speed is a tighter gear ratio that’s more suitable for trailer towing, which is maxed out at 11,100 pounds. Also returning for the 2017 Sierra 1500 is a 6.2-liter V8 that mates with the 8-speed automatic transmission. Look for 420 hp and 460 lb-ft of torque from this hefty V8, while towing capacity is upped to 12,000 pounds. Current mileage numbers for both RWD and 4WD editions packing the larger V8 remain 15/21/17. Depending on the trim level selected, expect the Sierra 1500 to again boast such exterior features as 17-, 18-, or 20-inch steel or alloy wheels, a trailer hitch and wiring, and step running boards. Inside, look for cloth or leather upholstery, heated and ventilated front seats, full power accessories, and cruise control; a tilt-only steering wheel and manual air conditioning on lower trims; and telescoping tilt-wheel steering and dual-zone automatic climate control on higher trims. All trims also offer a standard 4.2-inch driver information display, with upper trims boasting a remote garage door opener, a rear-view camera, memory for driver settings, and an auto-dimming rear-view mirror. The Denali adds standard power-adjustable pedals, front and rear parking sensors, and a heated steering wheel. All trims other than the Base feature Bluetooth-integrated OnStar directions and connections technology, and the SLT and Denali also include standard IntelliLink infotainment with 4G LTE Wi-Fi hotspot capability and new Android Auto smartphone apps. The SLT gets a 7-inch touchscreen, the Denali a standard 8-inch display with integrated GPS navigation. Expect the 2017 Sierra Base to pack an AM/FM stereo with 4 or 6 speakers (depending on the cab configuration) and an auxiliary audio input. The SLE adds a CD/MP3 player and internet radio, while the SLT tosses in satellite radio. The top-shelf Denali is expected to feature a standard 7-speaker Bose premium audio system. The popular 4WD-only Z71 Off-Road package offers an auto-locking rear differential, off-road shock absorbers, underbody shielding, a spray-in bedliner, and 22-inch alloy wheels mounting all-terrain tires. Further available equipment is expected to include various rear axle ratios, a power sunroof, rear-seat Blu-ray DVD entertainment, power-folding side-steps, LED cabin lighting, and new 18-inch all-terrain tires. An optional integrated trailer braking controller and various upgraded towing packages are expected to return for 2017, as is the optional SLT-oriented Texas package, which offers 20-inch polished alloy wheels, chrome tubular side steps, and the Bose premium sound system. Look for the 2017 Sierra 1500 lineup to carry standard 4-wheel antilock brakes (ABS), traction and stability control, front side-mounted airbags, front and (in Double and Crew Cab trims) rear head curtain airbags, LED daytime running lights, and a post-collision safety system. For 2017, a teen driver mode that’s similar to Ford’s programmable MyKey speed- and audio-limiting safety feature is expected to debut across the lineup. Higher trims also offer standard turn-signal-integrated mirrors, OnStar emergency telematics, and a remote antitheft alarm. The Sierra 1500 SLT and Denali will become eligible for an enhanced Driver Alert package boasting lane-departure warnings, automatic high/low-beam headlights, a safety-alert driver’s seat, and forward collision warning, now with automatic collision-mitigation braking. The National Highway Traffic Safety Administration gives the current Sierra 1500 its highest score of 5 stars for overall crashworthiness, while the Insurance Institute for Highway Safety awards the Sierra its best score of Good on all tests except the small-overlap frontal offset portion, for which it received a second-lowest score of Marginal. The 2017 Sierra 1500 is slated to go on sale in the late summer of 2016, when it will again challenge the likes of Ford’s F-150, Ram’s 1500, Nissan’s Titan XD, and the Chevy Silverado 1500. What's your take on the 2017 GMC Sierra 1500? Have you driven a 2017 GMC Sierra 1500?